Health care is one of the well-known sectors that touch every individual and government. The global medical outsourcing Market is estimated to surpass $276.46 and is estimated to grow at a CAGR of 2.5% during the forecast period. By service pharmaceutical dominated the market with 65% and is estimated to grow at a CAGR of 1.7%.By region North America hold the largest market share with 44.5% and is estimated to grow at a CAGR of 2.2% during 2017-2023. Medical outsourcing is the consignment of core services or procedures of the organization to a provider that emphases in that area of service or operation. The medical outsourcing market is divided into provider, payer, pharmaceuticals, pathology, and information technology. What are the major applications for Medical Outsourcing? The benefit of medical outsourcing service is that it enables patients to get the best medical observation from medical experts and specialized doctors. Besides, professionals and doctors providing this service are licensed and well trained. The main benefit of outsourcing healthcare services is minimizing of overall costs and hospital expenses without compromising the quality of patient service. The healthcare industry is assessing and formulating machine learning and artificial intelligence to steer patient outcomes and upgrade efficiency to improve results with low costs. Internet based technologies reaching maturity and are flourishing. Also, scientific developments in the field of connectivity and automation are having an upsurge. Advancement in voice recognition software is introduced to replace common office tasks such as scheduling meetings, greeting participants, recording meeting minutes and others. Users will be able to issue voice commands to manage individual, shared Echo devices, print documents, begin video conferences, and access calendars. Intelligent automation will recast the outsourcing industry with latest mixes, models, and motives. Outsourcing partners to manage, program and oversee their AI assets, train employees in current digital skills and help them chart a cognitive automation roadmap. 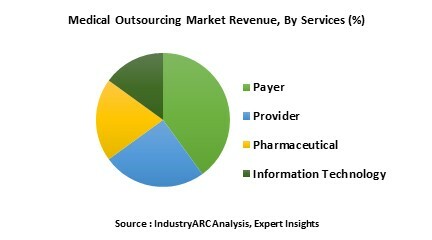 Who are the Major Players in Medical Outsourcing market? The companies referred in the market research report includes Mckesson Corp, Accenture, CGI Federal, Optum, Emdeon, TCS, Cognizant, Dell, Wipro.